Export – Used to export the filtered list and column order to Excel. In the screenshot example above this list is sorted by account number and has a filter set to see all rows where ‘Debit Balance’ and ‘Credit Balance’ is not 0.00 (zero). The match if = ‘Any’ makes sure we are not using an ‘or’ selection. This can now be export to Excel and it will be a trial balance that the user can add a total using Excel’s sum command. Delete – Deletes the highlighted GL account. This account cannot be deleted if it has anything posted to it. The user will be presented with a screen like this that includes all Spire stock reports and any custom ones added with a Crystal Report template of ‘General Ledger List’. The user would select the period they want to print, and whether they want to add additional details. The next screen would ask which report(s) to print, the printer selection information and if they want to email the reports. Note that all reports can be printed or emailed at once. Copy – Copy selected GL account. Revalue – Revalue the base amount for the GL accounts that are in another currency. The difference will be posted to the Gain/Loss setup for that specific currency. See the Multi-Currency module for more details. Delete – Deletes a GL account. This is only allowed if there are not transactions posted to the account. 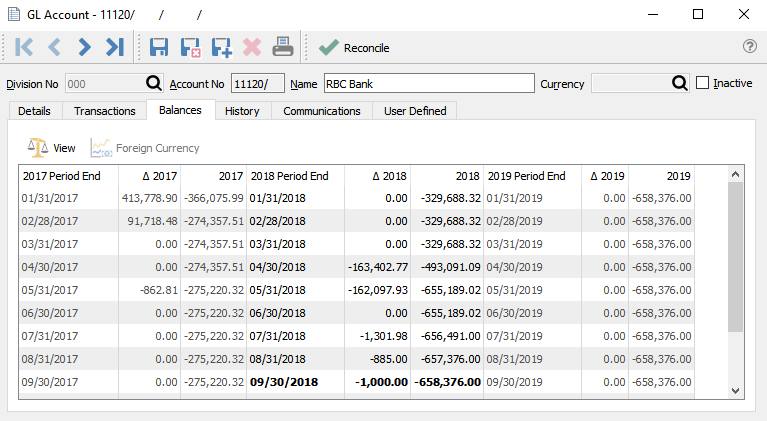 Reconcile – Click this to do an account reconciliation for this GL account. Most commonly it is for bank accounts and credit card accounts but any GL account can be reconciled. See Account Reconciliation for more details. Division – If Divisions are turned on in Company Settings/General Ledger, then each account will have a division. Each account will also then have a consolidated division of ‘000’. All transactions will get posted to a division plus the consolidated (000) division. Account No – The General Ledger Account number. Name – A descriptive name for the GL account. Currency – The currency assigned to this account. Inactive – If set to inactive the GL account cannot be posted to. Subgroup – The subgroup that the account belongs in. Subgroups are setup in Company Settings/General Ledger. Subgroups allow you to consolidate GL accounts on GL reports. Normal Balance – Select Debit if the normal balance is a debit, and Credit if the normal balance is a credit. Type – When the group is selected the type is automatically populated from the group setup. GIFI Account – An acronym for ‘General Index of Financial Information’ as setout by CRA (Canada Revenue Agency’ See this link for more information. Check Sequence – The next cheque number that will be assigned by default when paying from this GL account. Sales Account – Is this account set as a sales account. Bank Account – Is this account a bank account. By checking this the next cheque number field will be exposed and the account will become available to pay from. Revalue – When invoking the multi-Currency revaluation process, should this GL account be included. Filters – Set any numbers of filter to show only the rows of data required. Search Box – Is a search to look for word(s) in all fields. Export – Export the filtered and sorted list to Excel or .csv. 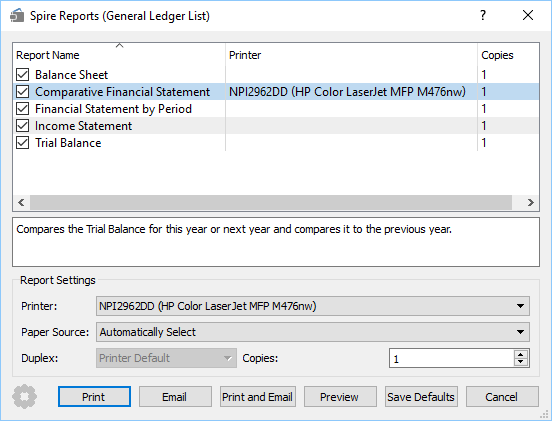 Print – Print any report with the Crystal Report Template of GL Transaction List. View – View the complete journal entry. Transaction No – The GL transaction number that was generated sequentially the next transaction number in Company Settings/Sequence Numbers. Source – The source that this posting came from. Credit – The amount of the credit transaction. Transaction Date – The the date that the transaction was posted to. Posted Date – The the date the user was logged into Spire when they posted the transaction. Memo – A memo added by the user doing a journal entry. Type – The type of transaction that was posted. Entity – The entity is the customer, vendor or employee code of the posting. Reconciled – The date that the entry was reconciled. If blank then it has not been reconciled. User ID – The initials of the user that posted the transaction. The GL is open for posting for 3 years. Once the year is complete, the year end process is run and the balances from this year get moved to last year. It is typical that today’s date falls into this year, but if the year end process is not complete then the user will log into ‘Next Year’ using today’s date. View – Highlight a period and click view and the transactions for just that period will show. Foreign Currency – Toggle to see the base and foreign currency values. Change Next Year – The amount that this account changed for that period for next year. Next Year – The running balance of the GL account for that period for next year. Change This Year – The amount that this account changed for that period for this year. This Year – The running balance of the GL account for that period for this year. Change Last Year – The amount that this account changed for that period for last year. Last Year – The running balance of the GL account for that period for last year. Once last year has had its final adjusting entries completed, the year can be closed. 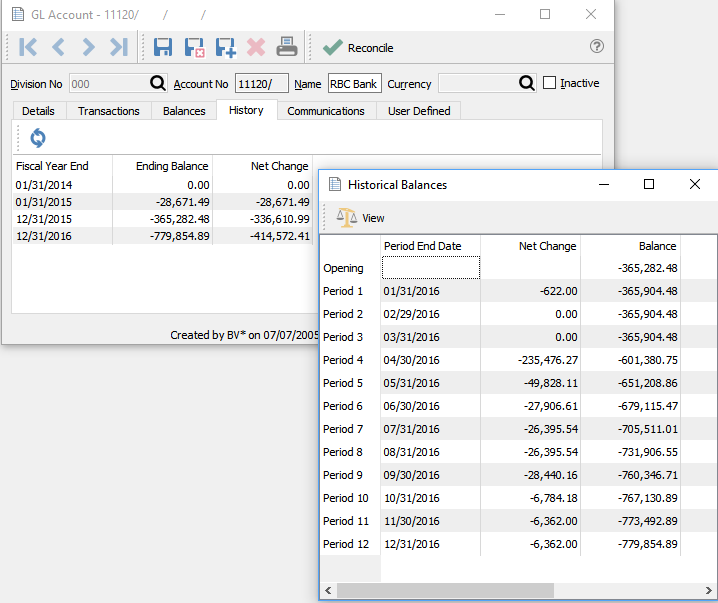 When it is closed the balances get moved to the GL History table and the transactions to the GL History Transaction table. Once there they are only available for viewing and reporting and can no longer be posted to. Fiscal Year End – Year end of the year that was closed to GL history. Ending Balance – The closing balance of this account when the year was closed. Net Change – The net change for that year. Once you drill down into one of the years you see each period. Period End Date – The end date for each period of the closed year. Net Change – The net change for the historical period. Balance – The closing balance for the historical period. Any number of notes can be added for this GL account. User defined fields can be added to track and/or print. (Spire UDF license required).